For the Love of Pete...: Do You Know What Time It Is? Too funny. We are smartasses here too....love it. I wish I had an easy button too. LOL, you got me because I thought you were going to say WWC Time! oh, so being male means something, eh? smartassedness is totally a word. you pronounce the "ed" as in blessed. well, actually blessed can go either way, as in 'blest' or 'bles-ed'. whatev. whatev is also a word, just saying. 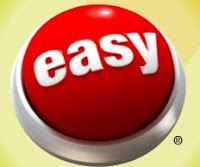 I actually have a real easy button like the one in the picture. I use it at school and the kids LOVE it! But that wasn't the point of your post, sorry. It is fun to push people's buttons sometimes.